All the work I’ve put into this picture over the past – oh I dunno – 10 days or something, really paid off, eh? 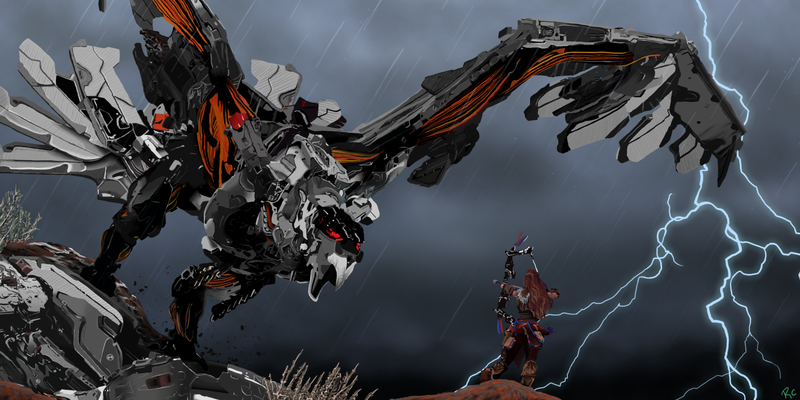 I’ve pretty much said it in every post since I started this Horizon: Zero Dawn project, but I’m super happy with how the process went. I truly don’t believe that there’s anything going on in this picture that, at this time, I could of done any better. So, I’m quite proud of this one in particular. All of that being said, I’m so happy that this project is finished and – as of today – behind me. I can’t wait to figure out what I’m going to make next. I have some rough ideas that I’ve spoken about in some recent posts, and they all include science fiction spaceships! I also have a couple saved images from some nice alien planet vistas that I might try and paint. Whatever I decide to work on next, it’s likely going to be something a lot less ridiculously detailed as today’s finished piece. Well, I say that now, but we’ll see how it turns out. I think it would be nice to just throw some color on a page and not get so detail oriented. For a little while, at least. Sometimes we all need to take a little break once in awhile. 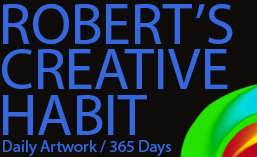 Tomorrow is July 1st (Canada Day), and that will mark the last full month of this Year of Creative Habits project. It really doesn’t feel like I’ve been working on this for a year. I guess when you keep yourself busy, time kind of flies by a bit. At least with this artist routine, as opposed to a regular job’s routine, I get to change things up whenever I see fit. For example, I’m always changing what time of the day I’m doing my drawing and writing. Not to mention using different mediums like Photoshop and actual paper. There hasn’t been a single day (and I’ve never missed a day of drawing, writing, and posting) where there was any hint of boredom. This entire year has been an enjoyable one. The year has been really good to me. There have been moments where I had very minor setbacks (Internet woes), but they were fairly easily overcome with a little confidence, patience, and some encouragement from friends, family, and those that inspire me. I just need to get the month of July in my rear view window and then I’ll be able to see the end of the road. 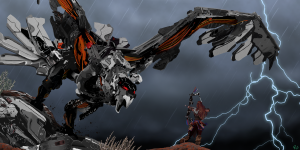 This entry was posted in Character, Photoshop, Scene, Work in Progress. Bookmark the permalink.